This review has been printed in the October 2018 issue of Chess Life. A penultimate (and unedited) version of the review is reproduced here. Minor differences may exist between this and the printed version. My thanks to the good folks at Chess Life for allowing me to do so. There is a great democratization of access to chess teaching and wisdom afoot in today’s always-on, interconnected world. While there are economic barriers to grapple with – not everyone can afford a tablet, laptop, or smartphone, of course! – it remains the case that with the free streamers and lectures on YouTube and Twitch, alongside daily news on leading chess portals, today’s players have a world of chess knowledge available at their fingertips. The only problem is finding the time to consume it all. For all of this free / freemium content, however, there are still precious few coherent teaching programs or courses available to the general public. It’s one thing to watch a few videos and feel as if one has learned something. It’s entirely another to work through a tried and tested, Elo-appropriate training system. To my knowledge there are only two or three such programs currently in print. The Stappenmethode, or Steps Method, is a more recent training system. Created by IM Cor van Wijgerden and Rob Brunia, the Steps are designed to bring a player from rank beginner to master-level strength over the course of seven levels or ‘steps,’ ideally under the tutelage of an experienced coach. While the Steps are widely used in Europe, they have (to my eye) only gained recognition here in the States in the past few years. I incorporate the Steps in my own teaching and training, and I cannot recommend them highly enough. One might also consider in this context Artur Yusupov’s nine-book series with Quality Chess. In this triple triptych – three three-volume series originally aimed at 1500+, 1800+, and 2100+ players – readers will certainly gain knowledge and skills to inch towards master, but the advertised target audiences are decidedly too low, and the books presuppose quite a bit of learning on the part of its readers. Now there is a new series of training materials from Jay “Coach Jay” Stallings, a leading scholastic coach in California and a member of the US Chess Scholastic Council. Coach Jay’s Chess Academy, as the set of fourteen books is collectively known, is immensely promising, and I can see it becoming popular both with those learning to play chess and (especially) those who teach it. Coach Jay’s Chess Academy takes a page from the martial arts and is divided into seven levels or ‘Belts.’ Each of the Belts – White (for players rated roughly 0-300), Yellow ( 300-600), Orange (600-900), Green (900-1200), Purple (1200-1500), Blue (1500-1800) and Black (1700-2000) – includes a lesson book, a puzzle book, and a Chess Passport with stickers to celebrate accomplishments and milestones. The books are extremely well designed, full of color and fun drawings to draw in young minds, and the ‘gamification’ of progress via the Passport and stickers is a master stroke. I recently had the chance to test-drive Stallings’ books at two weeklong, half-day chess camps here in Omaha. The morning group, consisting mainly of complete and near-beginners, was largely structured around the White Belt lessons and puzzle book. In the afternoon, with campers who were more advanced, we focused on attacking play, and I used pages from the Green and Purple books as part of those sessions. The White Belt books do a very good job of imparting the basics, including all of the rules needed to play a complete game except en passant. 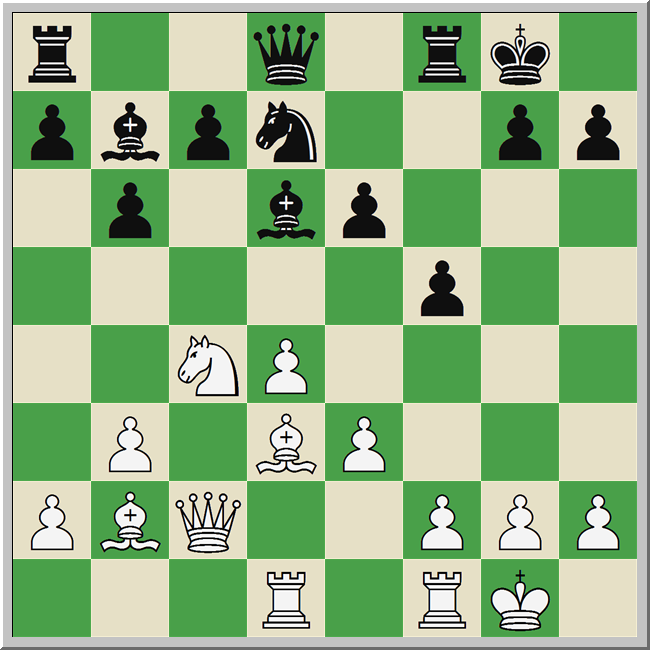 Because I began with a standard lesson on the pieces and the “three weird moves” of chess – castling, promotion, and en passant – this wasn’t a serious problem, but it does seem slightly odd to not cover it at the outset. Stallings follows his initial lesson on the pieces with a wonderful rendering of “Farmer and Pigs,” which I have always known (with slightly different rules) as the Anteater. White begins with eight pawns on the 2nd rank, while Black has only her queen on d8. White wins if a ‘pig’ gets to the 8th rank, while the ‘farmer’ (Black’s queen) wins by capturing all the pigs. The game seems simple, but it gets the kids moving the pieces very early in the learning process, and Stallings models basic strategy in the examples. Most importantly, it’s fun! The discussion of mates is also worth mention. Stallings uses a number of neologism, including the ‘rook roller’ and the ‘in-your-face’ (helper mate), to teach basic mate patterns. The kids quickly grasped these basic mates, and had little trouble extending their knowledge – “that’s just like the rook roller!” – to similar positions. They also, in a plot twist no one could have foreseen, loved bellowing “in your faaaace!” when mating their opponents. In the afternoon sessions, I focused on typical attacking ideas and motifs, including opening lines to attack a king trapped in the center, breaching castled positions, and knowing key checkmate patterns. We spent quite a bit of time on ‘attacking ratio’ or preponderance of attacking force, and I used Stallings’ pages on the Greek Gift from the Green Belt book to illustrate the ‘three piece rule’ popularized by Jacob Aagaard. The idea behind this rule is simple. A successful king hunt generally needs three pieces to succeed: one to give itself up for access, and two to deliver mate. (More generally, you can’t just attack because you want to. Your position must allow it!) The Greek Gift pattern, as Aagaard notes, is the clearest exemplar of this rule, and Stallings does an excellent job of explaining the key mechanisms. He shows two versions of the pattern, one with bishop-knight-queen and one with bishop-rook-queen, and importantly, he offers positions where the sacrifice is unsuccessful. One of the campers came to me the day after this lesson, proudly telling me that she’d pulled off the sacrifice in an online game. We retrieved the game from chesskid.com and looked at it as a group. True, she did win the game, and the final mate followed the typical pattern, but there were at least three junctures where her opponent could have diverged with easily winning positions. A junior’s making a mistake is not surprising, even when they are as dedicated and talented as this young lady. But here it raises the issue of good pedagogy. What does a player rated 1000 need to know to advance in chess? What is too much, or too advanced? Stallings’ lesson continues with discussion of Alekhine’s Block (using Alekhine-Sterk, 1921 as an example), and it concludes with a brilliancy that combines the two motifs. 13. …Bxh2+! The Greek Gift! 14.Kxh2 Qh4+ 15.Kg1 Bf3!! Alekhine’s Block! 16.Nd2 If 16.gxf3 Rf6 then Black must play 17.Rfe1 Qh3! before 18. …Rg6 or White’s king escapes. Keep in mind that this is a lesson in the Green Belt book, aimed at players rated 900-1200. Does it help them to see these complex patterns, or do they apply them inappropriately, sacrificing when the position does not justify it? I certainly don’t have a clear answer here, but my impression, for what it’s worth, is that Stallings tends to introduce material early relative to rating, while the Steps Method tends to introduce it later. This is not the only difference between Coach Jay’s Chess Academy and the Steps Method, but it is illustrative. Further discussion of those differences seems appropriate here, if for no other reason than the Steps are the closest analogue to Stallings’ books currently on the market. Stallings’ books are designed to get a player ready to play in a tournament quickly. Any player who can “complete a game without needing to be reminded of any rules” is, he says, ready for tournament play. This is reflected in the initial Belts, which are paced fairly aggressively (per the included Lesson Plans). The Steps, in contrast, are designed to be traversed very slowly, with tournament play being postponed for as long as possible. I don’t have a definite idea as to which is preferable, but I will say that in my experience, holding off from tournament play is a tough sell with American parents. Stallings’ books introduce material and concepts faster than in the Steps, as mentioned above, but with vastly fewer puzzles for practice and reinforcement. (Some Steps have over 2000 positions to complete over four or five workbooks.) This is, in part, due to the relative ages of both systems. Coach Jay’s Chess Academy has just been released after a successful Kickstarter campaign, while the Steps Method has been around for over thirty years. But it also may reflect a philosophical difference, again related to speed of progress. One key difference is the availability of support materials in each system. Each Step has a thick manual for trainers, containing model teaching materials, discussion of the psychology of learning, etc. The Coaches Guides for Coach Jay’s Chess Academy are slight by comparison. Again, this is something that I assume will be remedied over time, but for newer learners and teachers, having a fully-fleshed out ‘philosophy’ as in the Steps may be of no small benefit. Nota bene: I was a Kickstarter supporter for this series of books. I have never met Jay Stallings, and I have no financial stake in the success or failure of these books. See Chess Life, April 1997, page 25. See Aagaard, Jacob. Attacking Manual 2. Edinburgh: Quality Chess, 2010. 25. The Greek Gift first appears in Step 5, Lesson 14 (“Attacking the King”) of the Steps Method. Thanks to Rob Lazorchak for the reference. This entry was posted in Instructional, training and tagged Coach Jay, Coach Jay's Chess Academy, Jay Stallings on October 5, 2018 by fullcityplus.